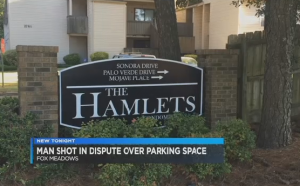 Did negligent security contribute to this apartment parking lot shooting? Read Our Legal Take to find out if the victim may have a legal avenue for justice and claim for compensation. Randall Wade, Jr., nicknamed Champ, was reportedly shot and injured in the parking lot of The Hamlets apartment complex in Memphis Saturday afternoon, August 6, 2016. According to WMC News 5, the shooting “happened around 4:30 Saturday afternoon. Police said Champ was walking to his apartment when [a suspect] came from behind the building and shot him in the stomach.” Police apparently told media the gunfire erupted following a dispute “over a parking spot at the complex.” Mr. Wade’s current condition has not been released. “The crime scene tape at The Hamlets was a shock for residents,” News 5 reports. “Residents…have seen enough violence and just want it all to stop. ” The complex was apparently the subject of a prior shooting investigation in February, according to The Commercial Appeal. What security measures, such as security patrols and surveillance cameras, were in place to deter crime at the time of the shooting? Was the apartment complex aware of the initial parking lot dispute? If so, were any efforts made by the apartment security or management to deescalate the situation or call police prior to violence? Generally, property owners are required to protect all residents and guests legally on the premises from any foreseeable harm. Should the facts of this matter reveal that the apartment complex owner or management company failed to provide adequate security to protect those on its premises, Mr. Wade may seek justice and elect to pursue a legal claim for his injuries..